Tongbei Quan is one of the more obscure and eclectic styles of Northern Chinese boxing. There are six most prominent boxing styles of Northern China referred to as six big gates (Liu Da Men), better known as Taiji, Bagua, Xingyi, Shaolin, Jiaomen Tantui (Muslim Spring Leg), and Tongbei. 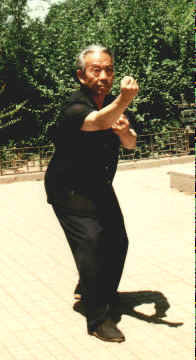 unique aspects and training methods of the Baiyuan Tongbei Quan, which translated literally, means "white (bai) ape (yuan) connected (tong) back (bei) boxing (quan). Baiyuan Tongbei Quan is one of the most famous traditional Chinese martial arts schools. Known for its powerful and useful fighting skills, people sometimes call it Heiquan or Black Fist. There have been several well-known masters in each generation of BYTBQ lending to its outstanding reputation as a fighting art.